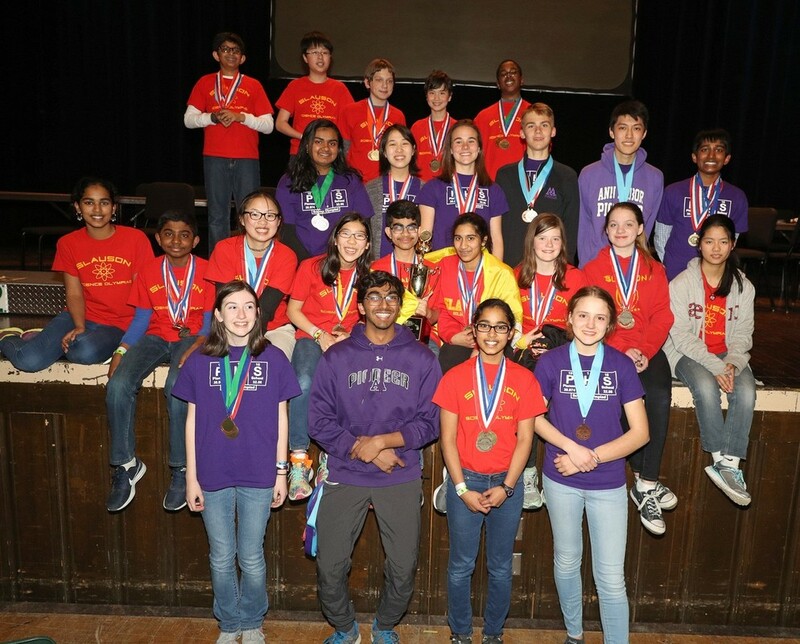 Science Olympiad is a nation-wide competition where teams of 15 students representing their school work throughout the year to build, study, and experiment. There are invitational competitions (for practice) and a regional, state, and national level competition near the end of the school year, during which students show off what they've learned all year by competing with other schools. There are 23 events to compete in, and each event requires 2-3 students to represent the entire team. The team who does best overall in all 23 events wins the competition. Our goal for this year is to get to nationals! We got this! ​We have been a Science Olympiad team since 1987. Our team is very active in helping to coach Slauson Middle School's Science Olympiad, and helped them get to Nationals last year. Our presidents are Sampoorna and EmJ, our Junior captain is Manish, and our treasurer is Polina (assistant treasurer is Anna), and we have 9 event heads (who lead the 23 events). You can contact us via email, text, or phone, and we will always try to respond within 24 hours. To join the team, pick out a few events that you are interested in and that don't conflict. Register before September 18th, 2018 to be part of this year's season HERE. To be on the main team, you must pick more 3 or more events to actively participate in, but if you can't commit that much time, you are welcome to choose one or two events to be a part of until December. You won't be able to compete on the main team, but you will still learn a lot about those subjects and have a great experience. More photos via Marc Klinger: Soon to come!